Natural Range: Southern China: Jiangxi, Hunan and Guangxi Provinces. The Ziyuan fir is known only from three areas in China, and is thought to number less than 600 individuals. 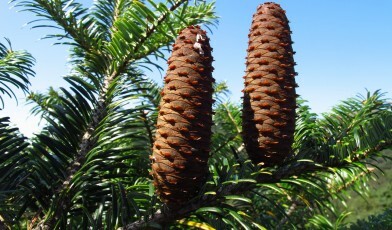 Alongside its close relative, the Yuanboashan fir (A. yuanbaoshanensis), it was described as a new species to science in 1980. The Ziyuan fir typically reaches a height of 20 to 25 metres and can be recognised by its oval crown, cylindrical cones with rounded tips, and smooth grey bark which, in later years, slowly decomposes under thick layers of epiphytes (a type of plant that grow on other plants). Like other fir trees, it is large and impressive when fully grown and is an important feature of the forest ecosystem where it occurs. It is typically found at high altitudes between 1400-1800m and helps to form a rich evergreen and deciduous forest that covers a dense undergrowth of bamboo. The species has a very small distribution due to heavy logging in the past. The population found in Yinzhulaoshan Provincial Nature Reserve (PNR), Guangxi, is one of four known remaining Ziyuan fir sites The population here is under particular threat having declined dramatically from an estimated 2,500 individuals in 1979, to 96 in 2004 to 50 in 2012. 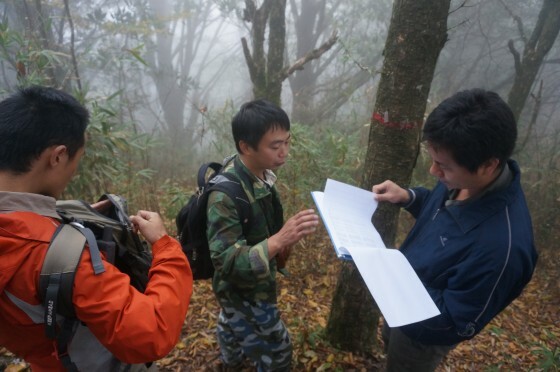 In 2014, thorough surveys of Yinzhulaoshan PNR revealed twenty-one new individuals, increasing the known population in this reserve to 71 trees. The primary issue for this species now, is the lack of natural regeneration within the population. In 2012, no seedlings were observed in the field; natural regeneration was clearly not taking place. It appears that male and female plants are failing to flower at the same time so pollination is failing to take place. Recognising the need to raise local capacity for tree conservation, Fauna & Flora International’s China programme and Guangxi Institute of Botany provided training to technical staff from Yinzhulaoshan PNR and helped them secure seed funding from the Flagship Species Fund in 2012 to undertake an assessment of the species’ conservation requirements. Monitoring programmes have been established for the Ziyuan fir. Credit: Lin Wuying/FFI. With support from SOS – Save Our Species, Yinzhulaoshan PNR were supported to improve protection and habitat management for the species and to develop propagation protocols for the species which is notoriously difficult to grow. Recently, project scientists have been undertaking an experiment to hand pollinate the population in the hope it will allow the species to regenerate in-situ. The reserve will also be provided with training and will be supported to exchange experiences and knowledge with other nature reserves in southern China helping it to continue these actions after the end of the project.